Can you imagine painting outdoors during the bitter cold snaps we have endured this year in north-central Kentucky? “Brenner’s view of the city’s parks and woods were THE thing in Victorian Louisville,” declared Heilenman. “Louisville author Meliville O. Briney once wrote, ‘If you grew up in Louisville, a Brenner painting on the wall is as much a part of your pleasant childhood as a rose-back sofa in the parlor or the fire of cannel coal that burned in grandma’s grate.’” While his works demonstrate a wide range of styles, including Realism and Romanticism, after 1878 Brenner was considered part of a group of Louisville artists known as Tonalists, who used muted color to evoke mood. Brenner paid special attention to seasonal effects and time of day through his sensitive rendering of natural light and shadows. Carl Christian Brenner was born August 1, 1838 in Lauterecken, Bavaria (Germany), and attended public schools there from age six to fourteen. According to “A Biographical Sketch of Carl Brenner” in The Biographical Encyclopaedia of Kentucky of the Dead and Living Men of the Nineteenth Century (1878), a teacher who recognized his artistic talent made application to King Ludwig I for Carl’s admission to the prestigious Academy of Fine Arts in Munich. The king readily granted permission but Carl’s father, a glazier by trade, refused consent for Carl to pursue further art studies. His father objected to art as a career, believing that nobody could make a living as an artist, and wanted Carl to train (and join two other sons) in the family business. The Brenner family emigrated to the United States in 1853, when Carl was fifteen. They landed in New Orleans, where there was a strong German presence in the arts community, and stayed there briefly before journeying upriver that winter to Louisville, Kentucky, which also had a substantial German population. Carl remained in Louisville for the rest of his life. He originally worked with his father as a glazier (which turned out to have been a handy skill for constructing that portable hut! ), then later as a house, sign, and ornamental painter. Carl’s artistic workmanship drew much admiration, however, even when used just for painting signs. 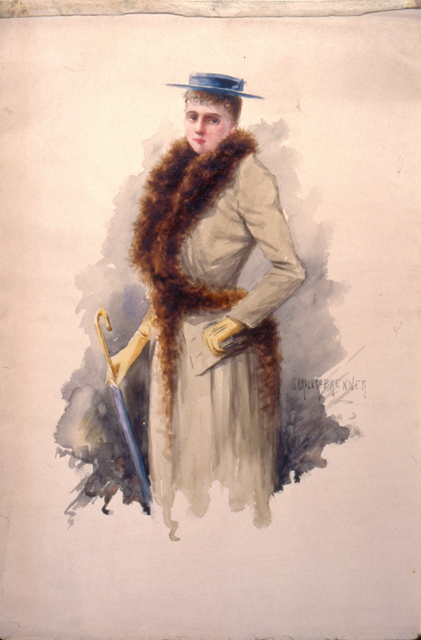 Not long after arriving in Louisville, Brenner’s talent was noticed by an influential patron of the arts, George P. Doern, publisher of the Louisville Anzeiger, a German-language city newspaper. After seeing Brenner’s pencil sketches of scenes along the Mississippi River, Doern advised him to become a landscape painter. In 1863, Brenner received his first professional artist’s commission, a vast panorama (35,000 square feet) of Civil War scenes, from its beginning through the battles at Chancellorsville, for the Masonic Hall of Louisville. By 1867, Brenner had rented a studio at 103 West Jefferson Street, where he pursued his true passion of painting canvases when he was not painting signs and houses to afford his avocation. 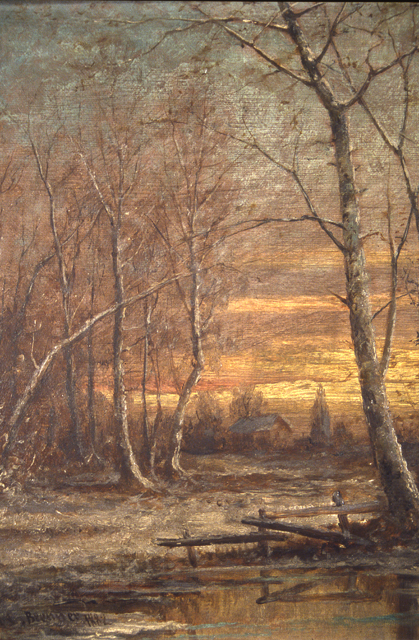 In 1871, Brenner began devoting more of his energies to landscape painting. 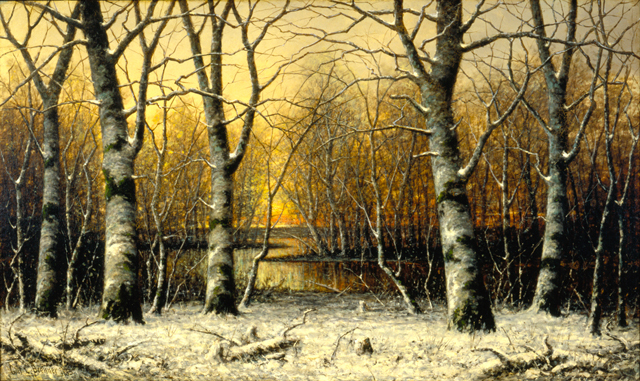 His friend, U.S. Representative (and future Kentucky governor) J. Proctor Knott is said to have boosted Brenner’s career around 1874 by arranging for the sale of his painting Beeches to William Wilson Corcoran, founder of the Washington, D.C., gallery that bears his name. (Brenner named one of his sons after Knott.) 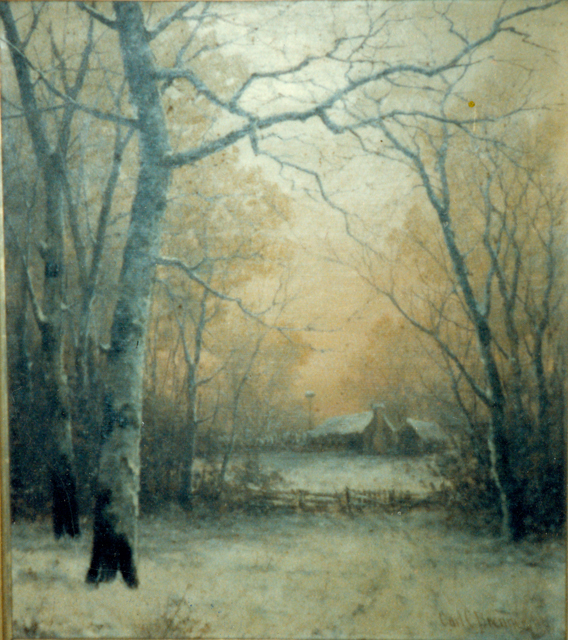 Encouraged by the Corcoran sale and the Civil War panorama commission, Brenner gave up his business to become a full-time landscape painter at the age of forty, using his earnings as a glazier, house, and sign painter to establish his own studio at 407 South Fourth Street (Fourth and Jefferson) in 1878. During his lifetime, Brenner was the most well-known of Kentucky artists. His paintings were exhibited in Vienna, Philadelphia, New York, and California, as well as regionally in the first Louisville Industrial Exposition in 1874 (and every subsequent annual exposition) and the 1883 Southern Exhibition on the site of what is now St. James Court in Old Louisville.